Currently sitting atop the FIFA rankings, a lot is expected of 2014 World Cup quarter finalists Belgium. Loaded with players who are excelling in major European leagues, the Red Devils are a favorite for the European Championship. 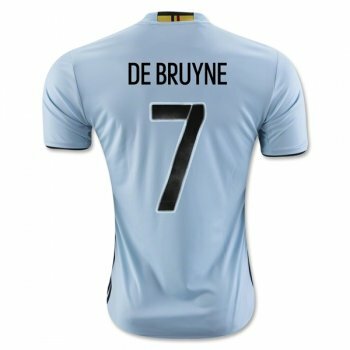 The 2016 Away Jersey is light blue, decorated with the country's tricolor combination of black,yellow, and red, and has the team logo on the left side of the chest. This jersey also sports a superior performance material with ClimaCool technology and its 100% polyester composition.